RoilBroil. 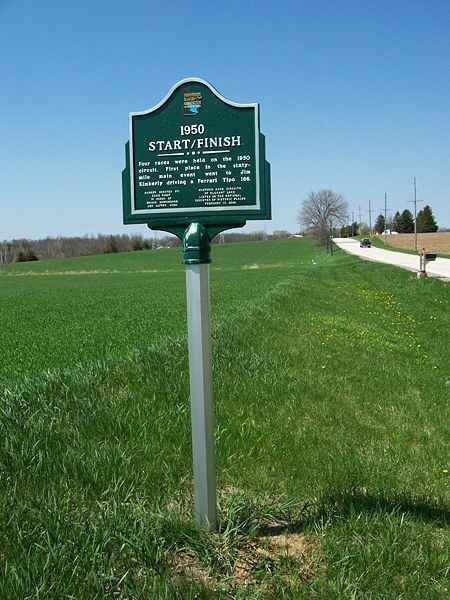 RoadAmericaOriginalStartFinishLine. N.d. Road America, 43° 49′ 40″ N, 88° 1′ 45″ W. Wikimedia Commons. Web. 12 Sept. 2013. Winston Churchill once acknowledged, “Now this is not the end. It is not even the beginning of the end. But it is, perhaps, the end of the beginning.” This wise statement applies much to the beginning of eighth grade, which engenders many changes in one’s life. As the first “Ding Dong Ding Dong, Ding Dong Ding Dong” of the school year greets our weary ears, the ears of more than a hundred eighth grade students, we begin to reflect on the eight years we have previously performed this same, simple routine. While on the surface this day may seem like all of the others, it is much more. It symbolizes all of the years that have past, the year we are about to experience, and all those to come. When thinking about my past starts to school years I become nostalgic for that “care-free” aspect of elementary school. Soon I remember that with the greater work, we have a greater independence and responsibility, well worth it. For example, in most classes I have noticed that now we can choose our seats. During past school years we were not allowed this due to the concern of us sitting in places and with people that would disrupt the class. Another way I see our freedom expanding emerges from the few subjects where we can organize our binders in a way that best suits ourselves. This seemingly small liberty beholds a great importance in the minds of us students, for it shows how teachers now trust our knowledge of what organizational method works best for ourselves. Thirdly, we are given the option of what elective to take, where as before we had to take music, art, and gym for both semesters in middle school and elementary. From when we started in kindergarten, we have been granted more choices each year, symbolising our growth in independence and creating new potentials for this new year. The year to come holds as many, if not more, promises as that of the preceding years. As in other years, now is a great time to become involved in new interests and activities. For example with our electives, you could have a new favorite class due to a new found interest in the subject. Interests are not just limited to this. After school programs and clubs present a great way to spark interests at the beginning of the new school year as well as to find new friends who share those interests. There also are new topics to learn about from new teachers. This year I can already tell that my teachers are amazing! Teachers who are really enthusiastic about their subject make it evident to their pupils by challenging and exciting the students which in turn can inspire brand new passions. In the future, after eighth grade, we will be presented with additional privileges, and with these privileges come the start of a new chapter in our journey through school. Next year, and the years to follow in high school and college will most likely be some of the most stressful years of my schooling career. There will be new experiences, and hardships, it will be the beginning of a whole new part of life, and the end to another. The famous writer T.S. Eliot said, more than 50 years ago, that “What we call the beginning is often the end. And to make an end is to make a beginning. The end is where we start from.” and he could not have been more right. This beginning of the school year is marking the end of our time at middle school, but with this end is coming the beginning of high school and beyond. This is where we are starting, and this is the beginning of the end. Caroline, well done! Your quotes supported your ideas well and I really enjoyed reading your work.